Many marketers forget customer acquisition isn’t the only way to sustainably grow their business. In fact, you might be better off pausing your lead gen campaign and turning to a tool that’s already in your CRM: your list. If you want to make the most of your marketing budget and grow your ecommerce conversions, start by converting more leads, getting more repeat purchases, and boosting your CLV (customer lifetime value). How do you do that? With marketing automation. Let me show you how you can effortlessly implement these tactics into your existing strategy – in just a few clicks. All thanks to all-new marketing automation templates. And here’s a great article, if you want to learn how to use email marketing for ecommerce. And if you prefer to learn by watching, rather than read the full article, just go to the bottom of this page, where you’ll find the recording of our latest webinar. Love at first sight happens in the movies – and sometimes in real-life relationships, too. But between a brand and a customer? Rarely. Unless you sell something people fall instantly in love with (like Tesla X), you’ve got to make an effort to stay in their minds and be remembered. The best way to do this is to make a lasting impression from the get-go. Capture customers’ attention and generate interest, from their first interaction with your brand. Welcome email campaigns make it easy. • Confirm contacts are now signed up. • Thank people who take the time to subscribe. • Say a few words about your brand or offer. • Direct customers to your most popular products or categories. Better still, welcome emails generate up to four times as many opens and clicks as other marketing messages! So why not give them a go: thank your contacts, let them know what’s coming next, and pave the way for their conversion. Need some inspiration? 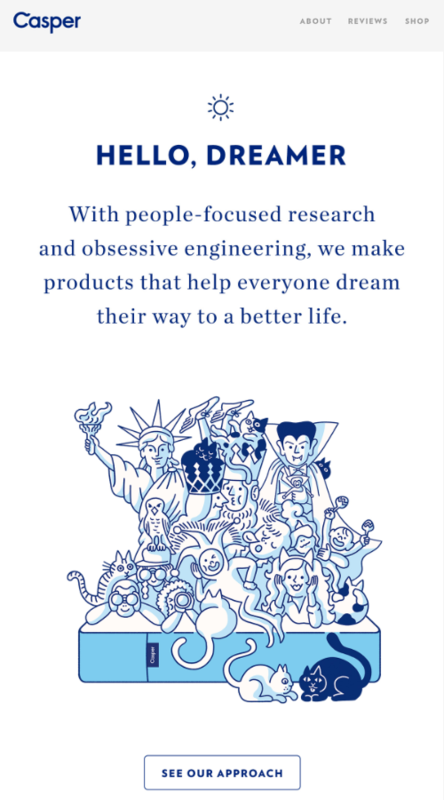 Check out these great examples from ecommerce companies, Casper and MeUndies, below. You can use a marketing automation template. Go to the welcome category, click on your chosen template, and edit the details (choose the list, subscription method, and email message). The other option is more manual. 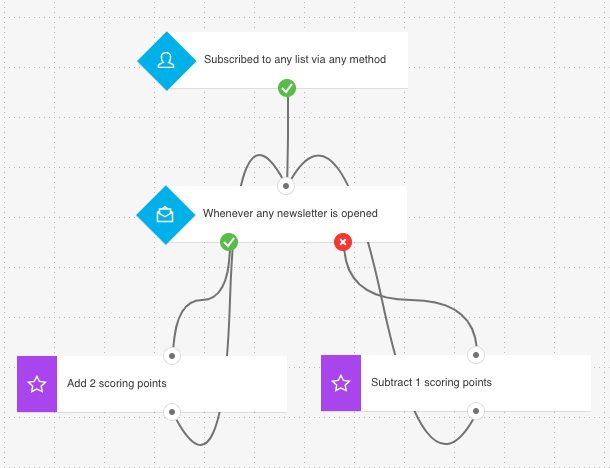 You need to create a marketing automation workflow that starts when someone subscribes to your list, say via a web form. Then simply add a second block to immediately send the email. Not all customers are the same. Some will buy from you regularly, even when you don’t offer any discounts or deals. Others will join your list and never open an email. Either way, you need to know who you’re communicating with. Especially if you’re in ecommerce business and don’t usually see your customers face-to-face. Once you do know who is who, you’ll be able to focus on the people who are more loyal to your brand – and better allocate your time and resources. Lead qualification is one way to do this. It lets you qualify your leads based on different criteria, such as their engagement. Best of all, it can be done automatically. But before you can start, you need to develop a tagging and scoring plan. You can then assign tags and scores to your leads based on the actions they take. It could be something as simple as opening your email, visiting your product page, or abandoning a shopping cart. 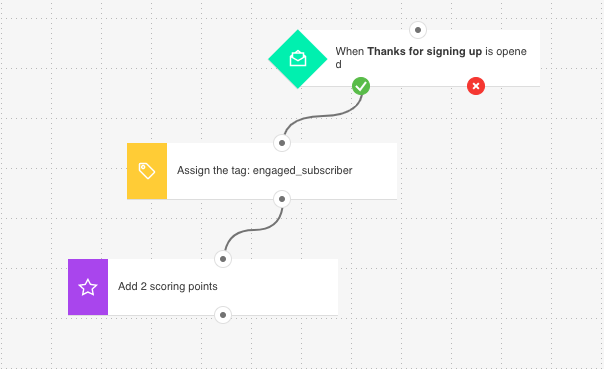 Next, you’ll want to come up with a system to automatically assign tags and scoring points. That way, all your data will stay up-to-date – and you’ll be able to act quickly. For example, when a contact has enough scoring points to be sales-ready, you can swiftly pass them to your sales team to seal the deal. Marketing automation makes it easy. With workflows, you can assign tags, add or subtract scoring points, segment your contacts, and move them between your lists automatically. And all in response to their actions. Again, there are two ways to launch a lead qualifying campaign in GetResponse. 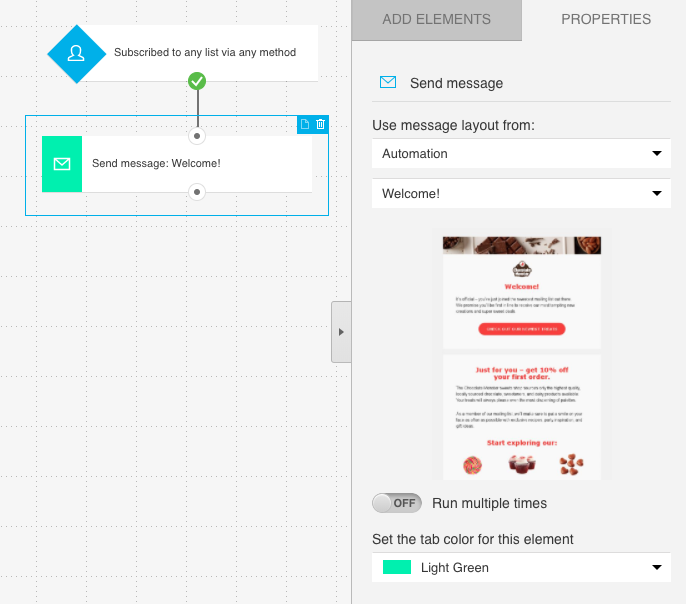 You can use a prebuilt marketing automation template, and edit it any way you like. This saves you having to map out the whole scenario yourself, since you can just use a blueprint that’s worked well for others. Basic scoring plan, basic tagging plan, and add contacts to CRM pipeline are all available in the template library. The other way? 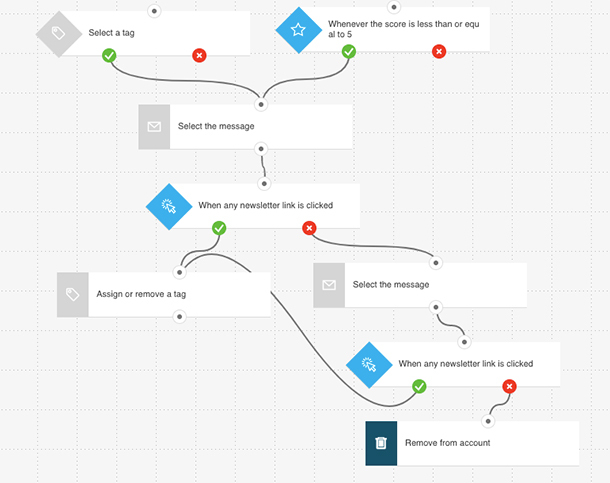 You can create your own marketing automation workflow from scratch. It can start with any condition block you like, such as when someone opens a specific email. Next, just add action blocks, and Tag and Score – and then choose the point values you want to assign. You can end the workflow there. Or expand it to include more elements like conditions, action blocks, or even filters. You can choose how advanced to make it. Many marketers working in the ecommerce industry make the mistake of just thanking their customers in the post-purchase email. But that can be a mistake. Why? Because the after-sale message can do so much more – and make a big impact on how customers view your brand. 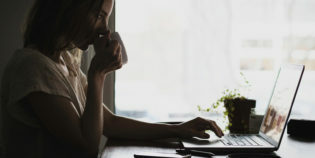 That one email has the power to enhance their entire shopping experience, shorten their buying cycle, and even increase their customer lifetime value. Act fast: Customers want to know if their payment was processed. Be memorable: Use strong branding and keep in touch regularly. Show good manners: Thank your customers for choosing you. Be helpful: Make product recommendations and send replenishment reminders. Be open to feedback: let your customers be heard and gain valuable social proof. Ask them share: Social sharing and referral programs can help build your customer base even faster. Automate: Whether you sell to 10 or 10,000 customers, make your campaigns stand out by tailoring content to their needs. 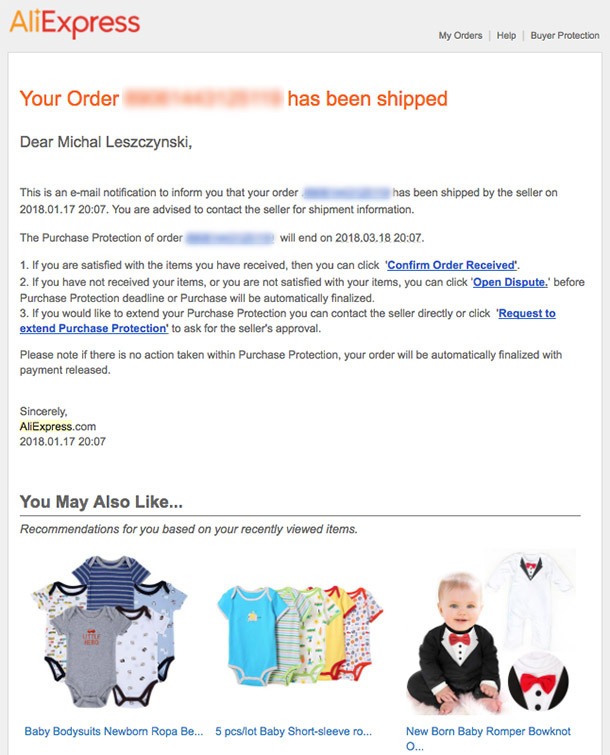 Here’s an example of an automated post-purchase email from Aliexpress, including product recommendations based on the customer’s order. 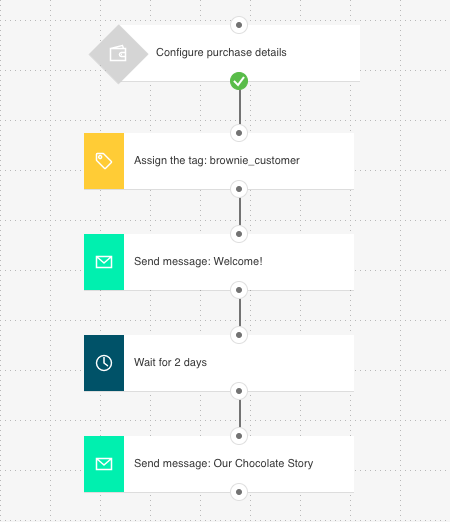 You can use one of our predesigned marketing automation templates, or create your own workflow. To do that, you first need to specify how the workflow will start. Someone visits a specific product thank-you page. Someone joins your customer list. An existing contact has an updated custom field value, such as the last-purchase date. Use API or our Magento or Prestashop integrations to send information about the purchase. Then all you have to do is add the rest of your condition and action blocks. One Tag block to assign a “brownie_customer” tag. 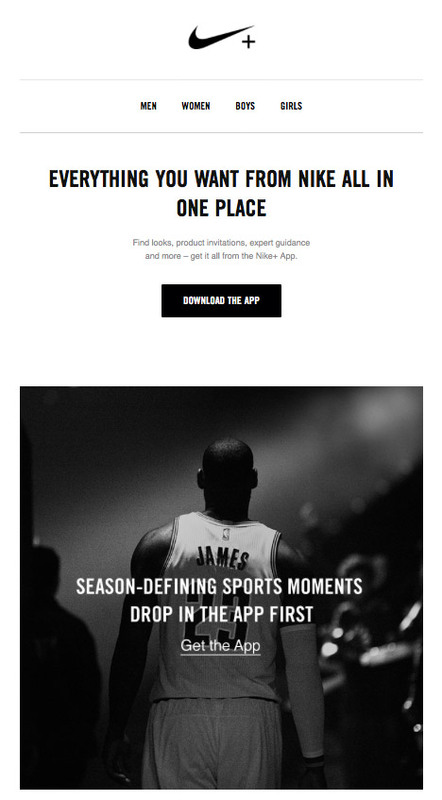 Two Send Message action blocks to send two emails: one to welcome new customers, and one to share the brand story. One Wait action block to delay the second message by two days. Strong, lasting relationships don’t just happen overnight. To really hook your audience, you need to put in the work and keep sending them engaging, relevant messages – long after their first interaction with your brand. You could launch a loyalty program. By rewarding your most active customers with special discounts and exclusive offers, you can make sure your customers keep coming back for more. Lead qualification can help you find these contacts. By combining tagging, scoring, and segmentation you can pinpoint your most loyal and valuable customers. Then simply send a highly-targeted offer they find irresistible. 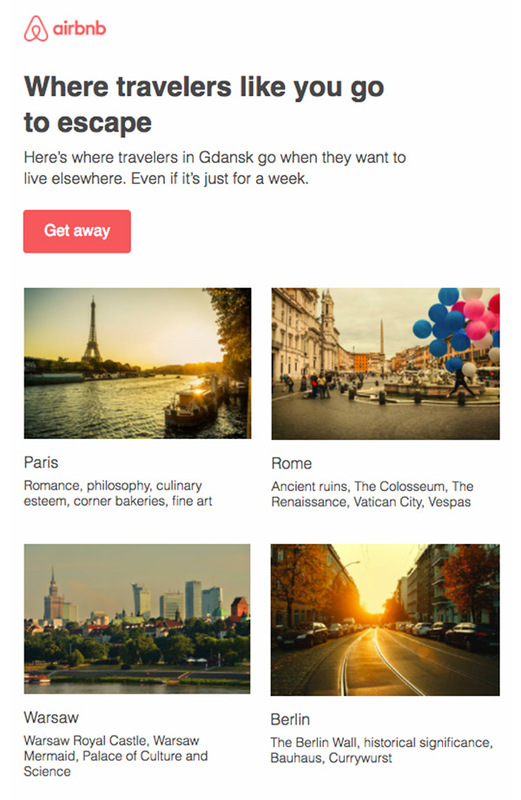 Like the one below, sent by Airbnb to their contacts located in Gdansk, Poland. You could also introduce a win-back campaign, to interest inactive contacts or past customers. To find them, simply create a segment that updates automatically when a subscriber stops engaging with your content. When that happens, be sure to send them an enticing offer. And remember, it can go beyond one email. Why not try combining your messages with remarketing campaigns via social media? Facebook pixel or Google AdWords can increase your odds of keeping your audience hooked. Just use one of the ready-made marketing automation templates, and edit it to your liking. The image below looks complicated, but I assure you it’s easy to get the hang of it. 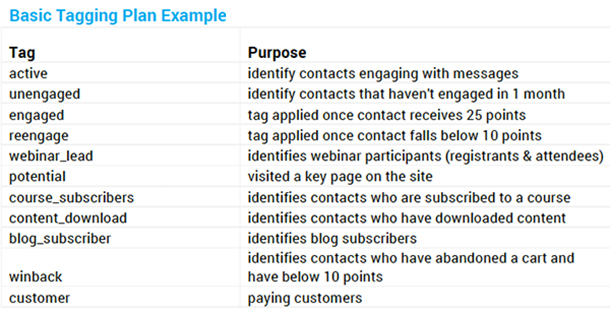 The workflow starts by identifying contacts with a specific tag and a scoring point below or equal to five. The specific tag is one you assigned to people who signed up over a month ago but never made a single purchase. Let’s call that tag “inactive”. Onto the scoring points: let’s say everyone who signed up to your list gets 20 points, and loses a point each time they don’t open an email. Eventually, some will end up with five or fewer points. Now you’ve found the inactive contacts, you can send a win-back campaign. If they don’t click your offer on the first day, you can send a second email. If they still ignore it, the workflow removes them from the list. But if they do click (considered ‘won back’), their “inactive” tag is removed and the workflow ends. There are many reasons why customers abandon their online shopping carts so often. And while you can’t save every sale, even slightly reducing your abandonment rate can have a big impact on the growth of your ecommerce business. How can you tackle this problem? One way is to run retargeting campaigns with emails or paid ads – or ideally combine both to cover as many customer touch points as possible. 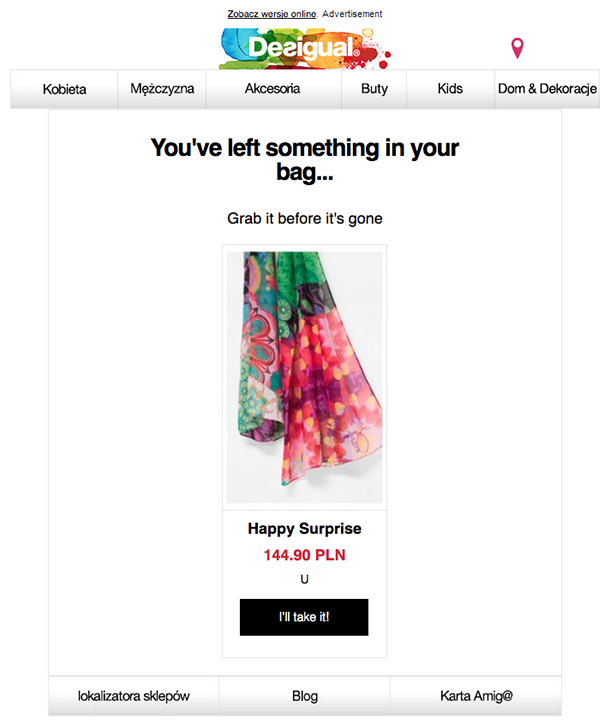 Your aim is to remind shoppers they left something behind – and then compel them to complete their order. I know, it’s easier said than done. Pam Neely’s article, Best Practices for Cart Abandonment Emails has some great strategies. Want to run remarketing campaigns using Google AdWords? Check out this piece by our PPC Manager, Michal Borowczyk: How to Reach Your Audience With the New Adwords Customer Match. 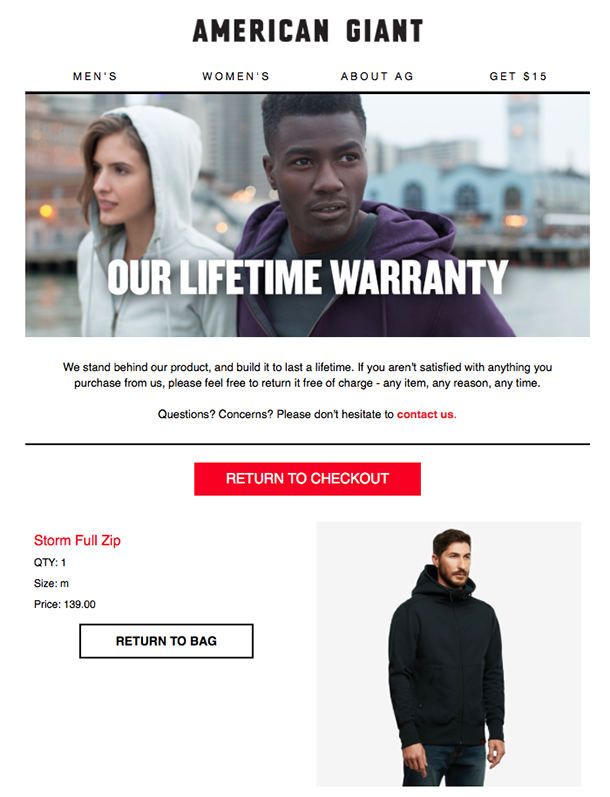 What do cart abandonment campaigns look like? Take a look at the examples below from retailer brands, American Giant and Desigual, for some inspiration. Once you’ve integrated your store with GetResponse, you can either create your own marketing automation workflow or use a pre-made template. We have an abandoned cart reminder and an abandoned cart series template you can use. As you can see from the screenshot below, the logic behind it is pretty simple. First, an email is sent as soon as a cart is abandoned. Next, check if the contact visits your chosen URL – such as a thank you page that’s only visible after they buy. If they don’t, the system sends another message. But if they do place an order, a special tag is added to identify them as a customer. I get it. 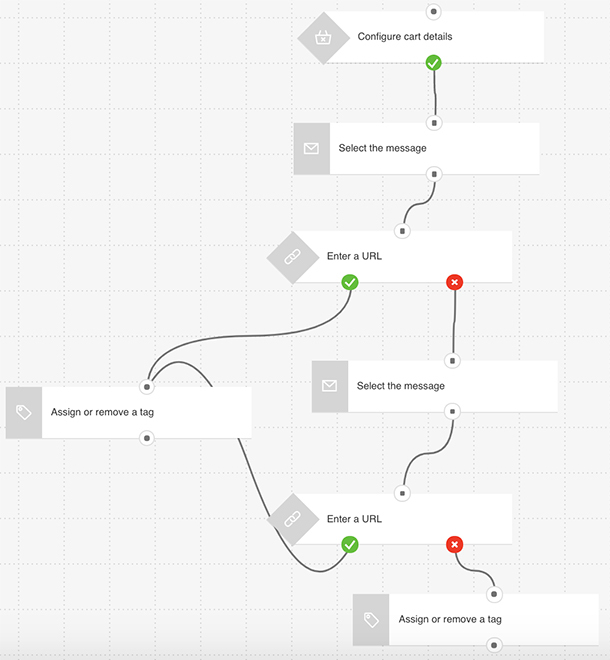 Shifting from simple email campaigns to building marketing automation workflows can be a big leap. Instead of just focusing on a single campaign, marketing automation is about looking further into the future and planning ahead of time. You have to ask: What’s going to happen next? How should I react to my contacts’ activity? Should I bother tagging and scoring them? 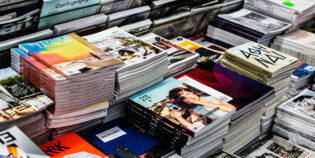 Hopefully, I’ve highlighted how easy it is to apply marketing automation to your own campaigns – and make a big impact on your business growth. If you’re still unsure about how to use the templates for your own marketing communication, check out this video recording of our last webinar. And if you need some more inspiration, take a look at this article that lists over 30 automated emails that can help you increase your opens and clicks in no time. So go on and explore the marketing automation templates in your GetResponse account. And stay tuned as we reveal more in the future! Want to scale your ecommerce business, sell more products, and turn your customers into brand advocates? Interested in how to run onboarding, post-purchase, win-back, re-engagement, or customer success campaigns? Then wait no more and get this guide to learn how marketing automation can help you achieve your business objectives. Refer 3 Friends to Become a Certified Marketer – for Free!